The hunter looks very proud of his hound and rather pleased with himself. He is a bit of a dandy, very neat. The dog looks up to him in adoration, in a very Great Dane-like manner. A keen, useful, faithful servant of Master. Delighted with the British Museum’s most excellent free image service that provided me with a high quality digital copy of this wonderful piece. It’s a print made by Johan Elias Ridinger published in Augusburg. 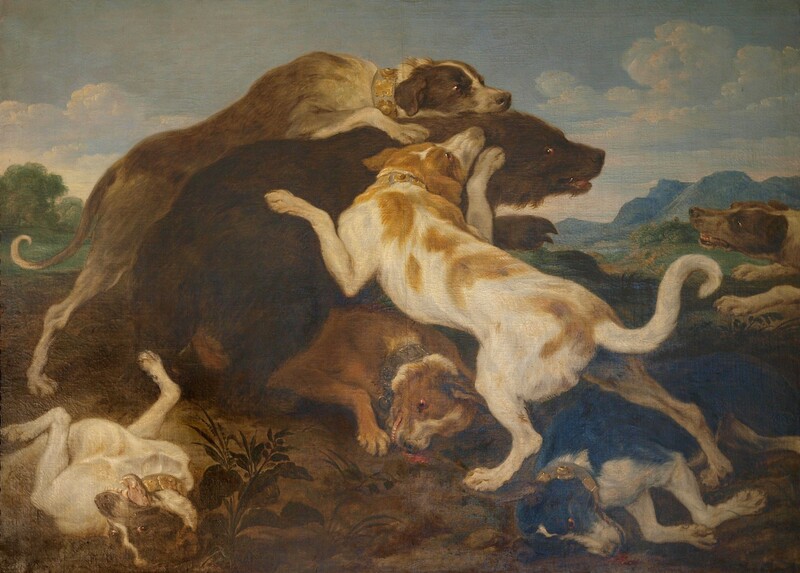 The description reads: ” A hunter standing in a landscape surrounded by three hunting dogs; from a series of hunters (male and female) in landscapes. 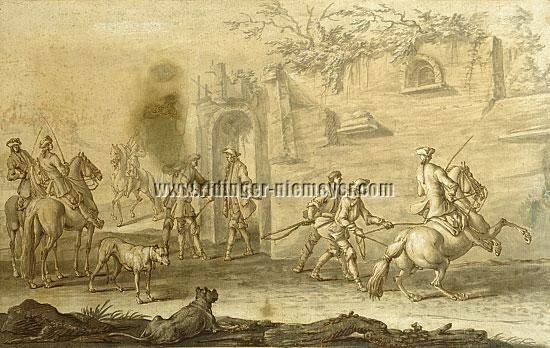 c.1730-60 Mezzotint”. 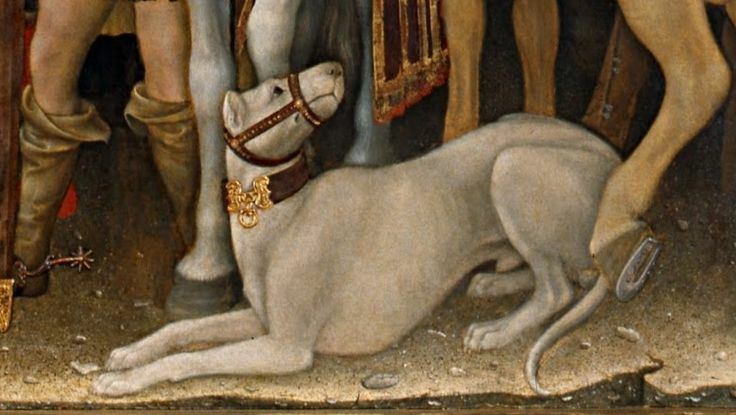 It’s by far the best Hound (of the type that interests me from a Great Dane perspective), that I’ve seen amongst Ridinger’s extensive portfolio (the British Museum has over 500 of them – and yes, I did go through them all 🙂 !) This is a detailed close-up of the dog. Having seen in our previous post the types of Bullenbeissers and Doggen depicted by Ridinger it is obvious that the dog pictured above is a very fine one indeed. It’s not a heavy bull-type Bullenbeisser (you can see examples of those further on). It could be argued that it was a bullenbeisser or a refined English mastiff – but I would remain unconvinced by the former and skeptical of the latter claim. If it was a bullenbeisser or an English mastiff then it wasn’t very typical of either (see a bullenbeisser or dogue de forte race / mastiff here and another here); that wouldn’t be surprising at all, as they weren’t pedigree dogs, yet; but being an artist myself I doubt that Ridinger, who was living from his craft, would have devoted so much of his valuable time (there’s a lot of work in this) to create a fabulous print hoping it would be popular and sell loads of copies, and be displayed in the finest houses, if he hadn’t tried in earnest to draw a dog that his most discerning clientele would admire and wish to own. I think this is one of his best efforts and just stands out among hundreds. The dog wears an expensive collar and fine (leather) lead; although substantial and strong-bodied, it’s also elegant: a graceful long-limbed Hound of quality and good size, smooth-coated, and although we can’t really tell the color from the black and white print it’s definitely not a dark shade and is without any visible patches. It might well have been fawn. It doesn’t seem to have a mask. Notice how much bigger the dog is than the others in the picture. It has a long Great Danish tail and houndy feet – but it’s definitely not a pure sighthound. The type is Great Danish or proto-Danish – of a ‘neither a mastiff nor a greyhound’ kind of boarhound. The head looks a definite progression from the ‘heavy duty’ snub-nosed bull dog of the time, the muzzle is long and if the mouth was closed it would look very Great Danish, just as the dog’s in the head studies here. The expression in fact is very typical of the Great Dane. I’d say this was a Liebhunde (life or body guard) or even a Kammerhunde (Chamber dog), wouldn’t you? Obviously the artist, vastly experienced in hunting dogs, knew his subject by heart and he could draw their type very well, in his distinctive signature style of course. The ears are cropped so the dog was definitely a valuable Hound, a specialized boarhound, unlike the generic unfortunate rough and ready Sauruden (see below) that were thrown to the bears and boars without the protection afforded to more precious dogs and were slaughtered in vast numbers as a result. Those poor dogs were expendable. This is a prized companion. I would tend to look at this as a proto-Dane, or proto-Deutsche Dogge if you prefer. It was definitely a dogge – because that’s what they called all big dogs. There’s no way of telling anything about its ‘pedigree’ – it could be a rendition of a Bullenbeisser x sighthound cross, or of an English Mastiff cross (Englische docke mind you wasn’t a term reserved exclusively for English mastiffs at the time: it was also another name used in Germany to describe Great Dane type dogs, lending credibility to the claim that the breed was in fact imported to Germany – from England and from Denmark – and not a native; the ‘Ulmer Hund‘ was more of the type depicted by Ridinger as “Englische Docke”); it could have been a portrait of a Blending or even a Danischer cross. Not quite the size of Great Dane proper perhaps but it was early days [and before the Souliot dog’s arrival on the scene – the Souliot theory will be examined in one of the very next blog posts]. 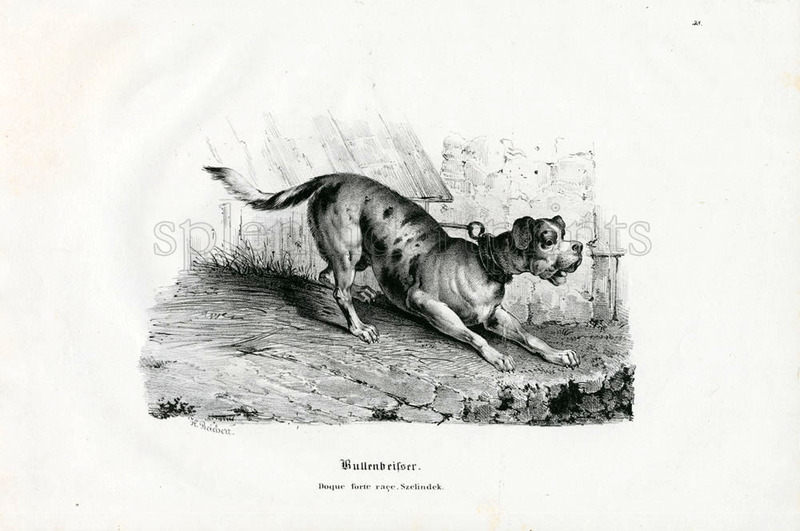 Whatever the parentage, or the concoction that produced this dog, its type is instantly recognizable, and type’s what matters – not so much what produced it; boarhound type can be arrived at by various combinations – and in this instance we’re looking at a Boar Hound of early Great Dane type : one of the first if not the first to appear in print in Germany in the mid-1700s of such fine quality and true ‘forerunner’ type. Perhaps the best ever engraving of an individual dog by Ridinger – and that’s saying something. and I think this is as good an indication as any (and there are many such, pictorial and other evidence) that the “forerunners of our present Great Dane” were not exclusively German and that they have indeed appeared elsewhere long before they appeared in Germany. Andrea Mantegna, Italian, 1431-1506. Painting from Camera degli Sposi, Mantua, completed 1474. Mantegna is one of my most favorite artists. His work is just mindblowing. He was a great Master. His camera picta is a masterpiece. It’s mesmerizing. I can look and look and look forever and a day and never grow tired of it. so yes, it it quite well known and I’m not “taking owls to Athens” by saying that hunting mastiffs of a refined type and Great Dane type dogs were all over the place in Europe, long before they appeared in Germany and long before they were christened Deutsche Doggen. Back to Germany then and in 1768, in his nice plate below, Riddinger has drawn a Baerenbeisser and an English dogue. The English dog is a beautiful animal and very well done. The bear dog is not that convincing, looks rather clumsy, in fact. The quality in the color plate, although impressive, can’t really compare with the much finer artwork & almost portrait-like characterization in the Mezzotint above. note: Hatz has a special meaning that is not transferred accurately in the English translation of the standard: to hatz meant to charge and seize the game on sight, and not as in the par force, drive and run it on until exhaustion, when the deer or boar could flee no more. The par force hunt was designed to offer extended entertainment to the nobles, just like the foxhunt, while the hatz (coursing) was practical hunting by the ordinary man. The Hatz dogs would attack the quarry trying to grab and immobilize it (at great loss of life and injury to many hounds) and physically cover it with their bodies so that it couldn’t escape, then the hunters would move in without much danger to themselves and kill it with a knife or lance. It was actually considered honorable and a great feat of hunting skill and bravery if a hunter managed to successfully impale a boar with his cutlass or hunting sword as it was charging at him. So the English translation of the standard should really be amended to include the correct ‘coursing’ term which accurately gives their true meaning to the terms “hatz” and Hatzruden. If used in a generic way the term means simply hunting dogs and includes all sorts of different types & landraces – not specifically “forerunners of the Great Dane”. It means simply ‘hound”. When used in the context of the boarhunt it does acquire a more precise meaning (boarhounds) but again its general and not significant of a specific ‘breed’, as several distinct types were used for hunting this quarry. It’s obvious that the Sauruden can’t be seen as “forerunners of the present day Great Dane”, if by forerunners we understand a sign or indication of things to come, dogs that displayed a proto-Dane or early -Dane type. Those didn’t. They were a totally different type of dog. (And perhaps the artist gave the standing dog a sad expression intentionally, in a rare sign of sympathy for these faithful workers that suffered a most gruesome fate). When I was a mere toddler in Greece all the boar dogs were of this type: rough-haired, medium size dogs. They were not a ‘breed’ but they were definitely a type. Their generic name is γουρουνόσκυλα (“pig dogs”). The landrace still exists but in rapid decline due to the advance of imported pedigree breeds. Their origin is unclear as the existence of these rough-haired multi-purpose utility dogs (used for hunting but also for guarding, livestock and farm duties) goes back a long time and there were some equivalent in ancient Greece, but it is more than probable that from time to time they have been crossed with imported breeds and landraces. Both heavy grip and hold dogs were used (bull types) as well as lighter and bigger, swift – running dogs for the successful pursuit of the very fast stags and boars, together with the game finders and scent dogs; these initially employed to track and lead to the game; and baying dogs that barked and surrounded it from all sides, ‘baying’ it, cornering or driving it towards nets and other contraptions used to confine and capture it in a convenient enclosure or ‘bay’ for the slaughter. Par force was butchery with a noble facade. Hatz was killing without pomp and ceremony. The more specialized dogs, like our Danes, were gradually developed and emerged superior among the various landraces and types of all shapes and sizes, precisely because experience showed they had the advantages of both worlds: they combined the sighthound speed necessary to catch up with the fleeing quarry and the power of the hunting mastiff to catch and stop it. These doggen and hounds were protected by the Hatzband (an especially broad fixed collar to shield the throat) and with armored jackets in linen, reinforced at the bottom with whalebone, similar to the modern boarhound jackets. Ridinger provides us with many good images of the dog types employed in all these hunting disciplines. (See also History for more links). -Irish Hounds (some Ridinger prints show wolf hunts). -English Bulldog, English dog, Dogge or Bull Dog (Englische Docke) considered the greatest type of dog; “some over 3 feet” or about 90 cm in height (1791 source). -Pommerscher Sau Rude, otherwise known as Pommer or wolfhound. (To hunt for bears “the strongest dogs to engage and grab and hold” were used, of which the “great English Docke, the Baehrenbeisser and the Strong Pomeranian dog” is best suitable, wrote Ridinger in 1750). See Franz Snyders’ Bearhunt for what these strong dogs may have looked like. Notice that they wear gilded and silver collars. -Pommerscher crosses : the ‘Pomeranian’ mix (presumably popular or originating in Pomerania) was considered to be the best for boarhunting; one hypothesis was that they were crosses of Great Dane type with the rough sauruden (see below). In English literature they are referred to as Large Rough Boarhounds. They could have actually been Irish Wolfhound type rough-coated dogs. –Danish Blending: see previous post. Also see below for the Danischer in Riding. This could actually be the Great Dane proper, the original Danish blending of English Mastiff and sight hound. They were also kept as favorites, lifeguard dogs (Leib Hunde) and house dogs (Chamber dogs); additionally they were considered good in Foxhunting, better than pure sighthounds because the latter suffered badly from fox bites. Very intelligent and trainable, good retrievers, also used in retrieving from water and learning tricks. -Grosse Bauerhund (large ‘farm dog’, stock-dog or butchers dog; these could have been the early rottweiler types or Swiss / Berne mountain dog and LGD types). See also Beryl Lee Booker’s book for mentions of the Bauerhund & Grosse Doggen (see a Grosse Dogge by Arthur Storch, from 1911, here; he was a fine sculptor and modeller). Another possibility is that the Bauerhund was simply the rural or rustic Dogge types or Great Danes used in farms for cart pulling and guarding duties. -Saufinder or Saubeller: they were named for use and were various types, or no particular breed; they would find the sow for the guns, also used as baying dogs in the par force hunt. Ridinger also shows us the English par force and the German par force Jagdt Hunde, Foxhounds and German ‘foxhound-like’ in type. These were pack scenthounds, trackers, pursuit dogs on the trail and game- catchers for smaller to medium quarry (fox, badger, polecat, roe deer, lynx, pine marten etc). We also see a Jagthund (upper right hand corner) by Theodor Hosemann, in J.C. Winckelmann, Zoologische Abbildungen (Zoological Images), Berlin 1840.
the dog is definitely not the small Dalmatiner (Dalmatian) as proposed by some (notice the pattern) but a Danish hound, very possibly the same colour as Raro. It is definitely hound-like, but not pure sighthound. The others are Budel (Barbet) type. 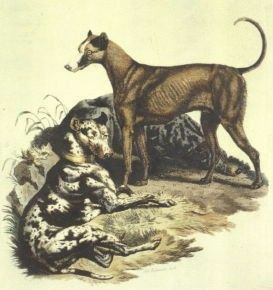 Compare with Sydenham Teast Edwards’ (1768 – 1819) Canis variegatus Harlequin Dane , with the Danish Dog by the same (1800) and with the Danish Dog from J. G. Wood’s Illustrated Natural History, circa 1850. Here’s another Danischer, the Grosse Danisher Hund, which went into the blending with the English Mastiff to produce the Great Dane. showing a heavy bullenbeisser to the right and a Great Dane hound type dog standing. A very rare Ridinger plate depicts a cropped Great Dane type dog, in the foreground, Aurochs – hunting (obviously an imaginary scene as the last of the Aurochs species, which was hunted to extinction, died in Poland in 1627; obviously these magnificent animals left some strong impressions), together with bullenbeisseren and Sauruden. another, heavier type dog, boar – hunting (while the wretched sauruden are mostly dying). and these snub-nosed bull-dogs / Bärenbeissers that had been bear-hunting. Ridinger states that the hunter is Polish and the dogs are Dogues. and with these Leib (Life, body-guard) hunde & Kammer (Chamber) hunde who are obviously heavier type doggen – bullenbeissers or bullenbeisser x mastiff crosses. “Five Dogs” Johann Heinrich Wilhelm Tischbein, 1806/7. “creation of the breed” ? Was it a breed created from scratch in 1880 – not a landarce that existed -forget centuries- for at least a few decades before that date ? Is a breed created on the date it becomes a pedigreed dog, even if the type existed for sometime beforehand? I don’t ascribe to the breed’s ‘creation’ notion – I am rather of the opinion that the word ‘standardized’ is more appropriate. Call me pedantic if you must – but creation sounds a bit conceited…Dobermann, Martinez, to some extend von Stephanitz, created a new type of dog. The Great Dane already existed, as a landrace. The Deutsche Dogge was ‘created’ from bits and bobs – but give the Great Dane it’s rightful place; in other regions, the same type, the Great Dane type, continued to exist, was gradually developed and eventually ‘fused’ with the Deutsche Dogge, in varying degrees. As I said before, it’s the type that matters – not so much the ingredients or different local recipes; so it’s good to know the past in full and not just one official version of it. How else can we fully understand and appreciate type? I find the stern denial of any ties with Denmark rather perplexing, if not downright suspicious, as so much can be found in pictures and in writing about the contribution of that country and Danish dogs, if one cares to look. And no, I’m not even remotely Danish (as far as I know, anyway!) – I’m just looking at things from a third party’s perspective. I like to see credit given where it’s due. Shouldn’t the parent club of the breed encourage all-inclusive research and education? Shouldn’t it behave towards all fellow FCI country-members equally and fairly, as it is in charge of the breed for some 80-plus members of the federation, and not simply a narrowly national club ? It’s a shame that so many modern writers, institutions and researchers have gobbled up this rather eclectic version of breed history and fell for it line hook and sinker, repeating it on every occasion and telling us that “the Great Dane is a German breed and has no connection whatsoever with Denmark” (that is the party-line commentary every time a Great Dane appears in group competition, be it at Crufts or Westminster or a show near you, anywhere; and that is what we read in official breed club websites and pages: half-truths; essentially, lies! Shouldn’t they know better?) There’s even some whining about the perceived hostility “of a political and nationalistic nature” against Germany in the DDC history page (pots and kettles, anyone?) Is everybody else supposed to forgive and forget and behave neighborly, while the Ruler above ignores them? I remember the occasion of the FCI European Show in Denmark in 1997, when the DKK issued a centenary booklet and celebrated the Great Dane as a Danish breed. No ‘civil’ war broke out in the FCI. That was refreshing. Maybe Denmark has to wait another hundred years for the privilege to be imperiously granted again… And I would say the very exact same thing if anybody tried to expunge the German contribution to the breed – or any other documented contribution, of genetic or cultural significance, as a matter of fact. This lazy unhistorical, uneducated and bigoted attitude annoys me, not only because it’s disingenuous and unfair, abusing position of power to erase someone else’s legacy and accomplishments, but also as it doesn’t do the breed any justice: the Great Dane has an older and broader history than what the official version reveals. It’s silly to mention Babylon, the Himalayas, Alexander the Great’s and other eras, places and connections far removed, yet deny next door Denmark its dues! Nobody would ever dare to belittle the tremendous importance German breeding has had for the breed and expect to be taken seriously; but to rub out the Great Dane’s prior existence in the country its name – at least partially – hails from, is as stupid as cutting off the nose to spite one’s face. Re-writing history is pointless because the truth is out there. It’s just embarrassing for the honest and objective German researchers and Great Dane lovers; isn’t it high time we save them from this perpetual embarrassment (which they don’t deserve, they don’t deserve this stain of being seen as economical with the truth), by restoring the facts about the Great Dane, letting everyone rejoice in what’s known of the breed’s history, welcoming every new detail and valid nuance that emerges, celebrating it, without snooty nationalism and close-mindedness? The breed is an international breed and has a very rich pan-European History. Unlike being ‘a mere dog breed’ it’s part of shared social history, it has cultural significance and it was many cultures that contributed to this. British, Danish, German and other people from many countries around the world have written and are continuing to write valid chapters in this unfolding story. We should try to emulate the magnanimous spirit of our dogs and avoid the poison of immature, small-minded pettiness and unfounded exclusive ownership of the past. Nobody exclusively owns the breed and nobody exclusively owns its past, present and future. It’s a multitude of people that are affected by it, have a valid interest in it and valuable input to offer. I would personally lean towards a joint Danish, British and German patronage of the Great Dane, as offering the best possible solution for the origin debate and most importantly for the best management of the breed. I’m not saying that’s the only way, but maybe it offers advantages in comparison to how the breed has been managed so far – and even the DDC’s President has admitted failure in his letter that you can read here. So what I’m proposing is simple: those who can’t harmonize with the orchestra should withdraw from the conductor’s podium and let someone else – or a wider consensus – give it a try and be judged by results. The interested parties that would be sincere and mature enough to make the noble gesture and agree to work together as equals, would be the parties most fit to manage the breed in the 21st century, the parties that I for one would bow and chapeau to, as it is a global breed and needs a broad, international, transatlantic, global agreement for its preservation. It needs fairness, sincerity and justice too, as without these qualities no healthy endeavor can be undertaken or hope to succeed. And we can hardly call the breed’s disintegration in the last four decades a success, can we? So we all have to step up. It’s not too late. But it is imperative that we amend our ways and work together for the breed without blinkers and without walls between us ! The Great Dane is suffering from gross deviations of type and soundness right left and center – it’s not a situation that can be dealt with an isolationist mindset. We are facing a very difficult situation in dog breeding, affecting type, health, longevity, that is crucial for the breed’s future and not unique among pedigree dogs; so what’s needed is a ‘new deal’, a new, reformed, rational and efficient way of managing breed populations; democratically, scientifically, with the greatest participation possible; with open discussion, camaraderie and a truly global co-operation; these are essential to secure funding for genetic research and establish a world-wide pedigree database. To successfully tackle the breed’s problems. Imperial attitudes and absolutist ruling of the “L’Etat, c’est moi” mentalité belong in museums as curios for psychological study, to be viewed with a mixture of contempt, pity and mild amusement – not in real life in modern societies. Let’s all try and get back to basics.